QUIET & QUALITY PROTECTION - The adjustable headband makes hearing protection ear muffs perfect fit and seal against noise. 22dB NRR baby noise cancelling ear muffs provide efficient noise reduction, meets ANSI requirements. LIGHTWEIGHT & DURABLE COMFORTABLE - Baby headphones designed with noise-dampening sponge, soft ear cushions and solid ABS ear cups that seal around ears to ensure comfort. The unisex color design for both baby boys and girls. PORTABLE & EASY PACKING - Our baby noise protection headphones feature a fold-able style. Compact for slipping for effortless storage and portability, lightweight and collapse to an easy packing size to transport in your bag or child\'s backpack. SAFETY & MULTI PURPOSE - Suitable for baby under 12 years old. 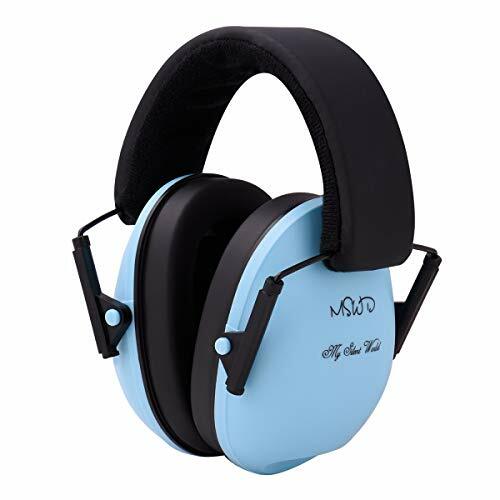 Ideal for blocking noise caused by large crowds, airports, garden and household tools, flying, traveling, concerts, construction, fireworks, even taking toddlers hunting or any other troublesome noise. ZERO RISKS & SATISFACTION GUARANTEE - Free for 90 days or your 100% money back guarantee.